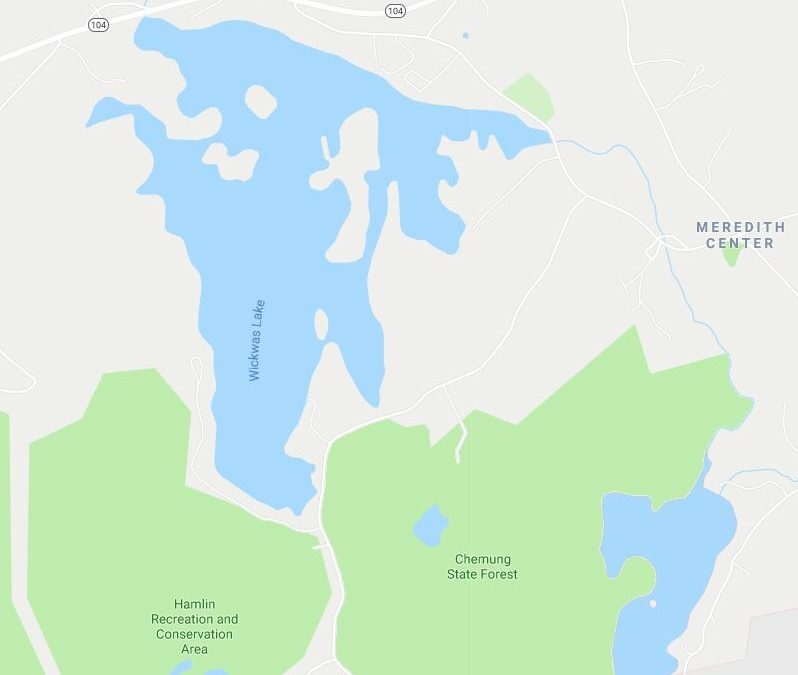 Spelling matters – for one New Hampshire lake, at least. Hey Google, what's that K doing there? The 330-acre lake is known to Thorpe and neighbors as Wicwas, a name whose origin is lost in time although Thorpe says it’s probably “some kind of derivation” from a Native American name or term. The problem is that some official sources know the lake as Wickwas, spelled with a K.
Significantly, those sources include the New Hampshire Department of Transportation, which puts out road signs, and the U.S. Board on Geographic Names, which has the final say on the official name of things. Other state agencies aren’t so sure. Fish and Game calls it Wicwas without a K while the Department of Environmental Services, Thorpe says, can’t make up its mind. “DES tends to do it both ways, depending on exactly which report you look at.” This wouldn’t really matter except that it can get in the way of people finding the lake or things named after it, since Google follows USGS spelling and uses the K on its online maps. There are even some lesser complications, such as tourist items. “Anecdotally, we have a concern about shops that sell souvenir gear that has the name. They could misorder these unless they were pretty sharp,” said Thorpe, who has lived on the lake with his wife, Marge, for 35 years. The couple received the John Morten Award from the New Hampshire Lakes Association in 2014, in recognition of their decades of work overseeing environmental efforts on the water. The Lake Wicwas Association and the Wicwas Lake Grange decided this year they had had enough. With the backing of the Meredith Center Board of Selectmen they got local state representatives to sponsor a bill getting rid of the pesky K once and for all. “The lake along Route 104 in the town of Meredith shall be named Lake Wicwas. Appropriate signage or markers may be placed at or near the lake site,” says Senate Bill 132, which was passed unanimously by the Senate transportation committee this week. The sign that locals really want changed is on Route 104, coming into town from the west. The K in the name on that sign really rankles. It’s not unknown for the state Legislature to take up bills tweaking or changing the name of geographic features, although it doesn’t always stick. In 2016, for example, Dover asked that the Cocheco River be renamed the Cochecho River, with a second “H”, citing historical spelling, but the Board of Geographic Names disagreed. They also disagreed after the state Legislature in 2003 voted to rename Mount Clay as Mount Reagan, in honor of President Ronald Reagan. Probably the most publicized name change of recent years came when a small body of water in the town of Mont Vernon was renamed Carleton Pond after a local family, a change that federal board approved in 2012. Mont Vernon residents decided they had had enough of the previous designation of Jew Pond. That name was applied in the 1930s after two lawyers from Boston tried but failed to open a fancy hotel in town that would cater to Jewish vacationers, who at the time were sometimes turned away from New Hampshire hotels. There’s one other point to note about the Lake Wicwas bill: The order of words in the name. “(Department of Transportation) says Wicwas Lake, but commonly around here we put the word “lake” ahead of Wicwas. It would also fix that little issue,” said Thorpe. Word order, however, might be a little less settled locally than the spelling. Just ask the century-old Wicwas Lake Grange. Also: Pawtuckaway Lake vs Pawtuckaway Pond (see https://en.wikipedia.org/wiki/Pawtuckaway_Lake). Which also raises the (sometimes heated) question of what’s the difference between a “lake” and a “pond”.